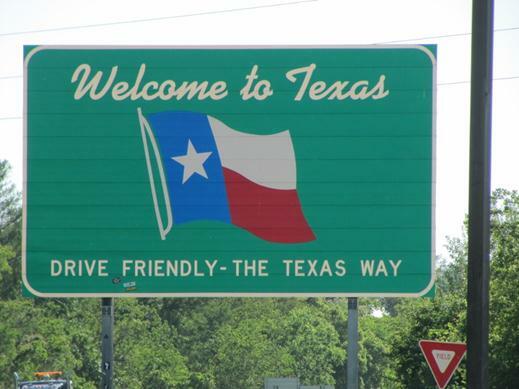 We finally entered the grand state of Texas! 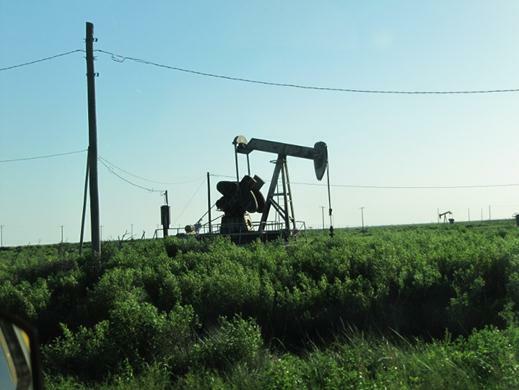 The land of oil fields, longhorns, open plains, mesquite BBQ, cowboys & rodeos and of course we would never forget the Alamo. During our first stop we learned just how hot and humid it already is in April….highs in the 30’s and lows in 20’s and 95% humidity! The visitor center ladies had quite a chuckle when we told them we planned to tour Texas without air conditioning in the trailer. 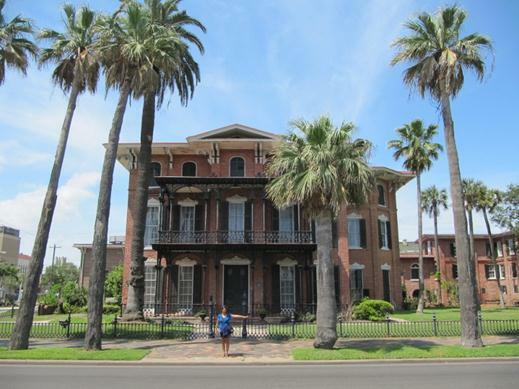 First stop on the Texas Gulf Coast…the historic city of Galveston. 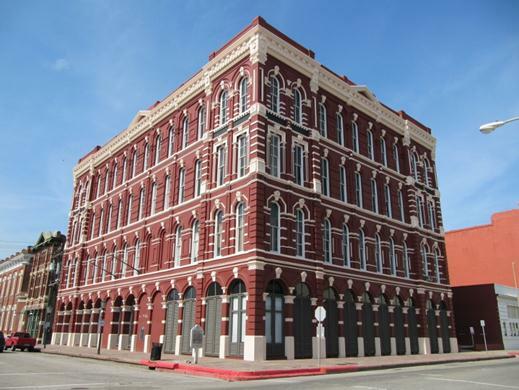 At the turn of the century this was the most promising city in Texas until a massive hurricane almost wiped it out. 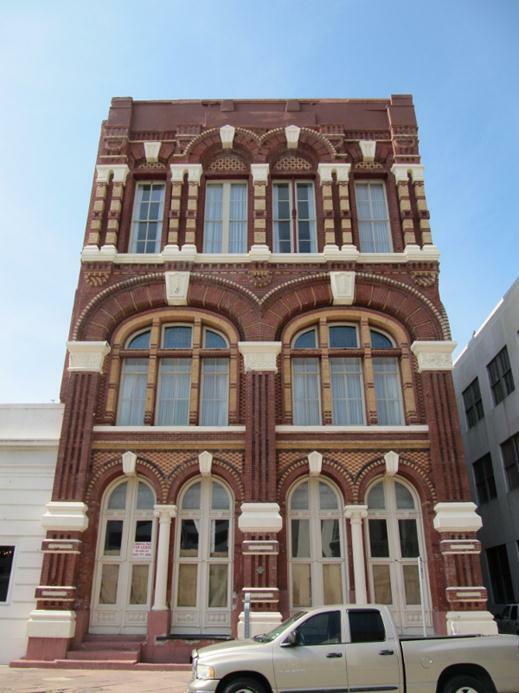 Galveston grew as a resort town due to its miles of sandy white beaches. 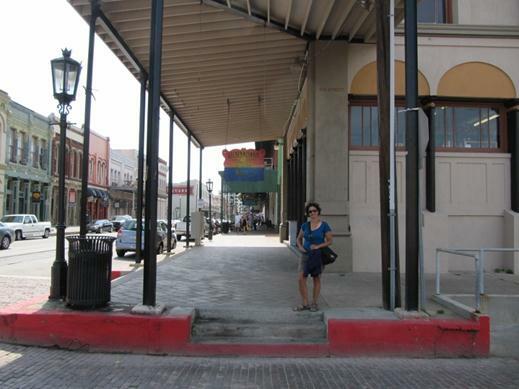 In 2008 Galveston was hit by the massive hurricane Ike which swallowed the entire island in 8 feet of storm surge. The city is still recovering. 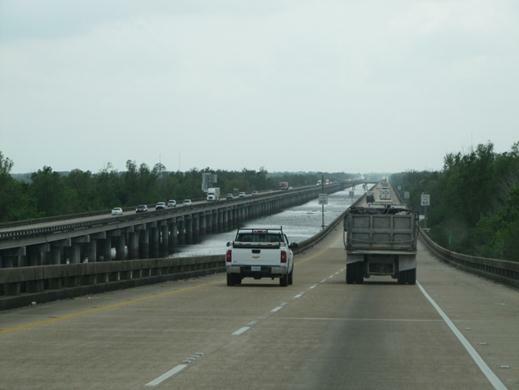 Through Louisiana we travelled on raised highways to cross the many swamps and bayous. Most Texans really do drive friendly. This is one of the few places where drivers don’t end run poor Wendy when she’s trying to merge onto highways. The first of many oil derricks but a surprise to see it along the coast. 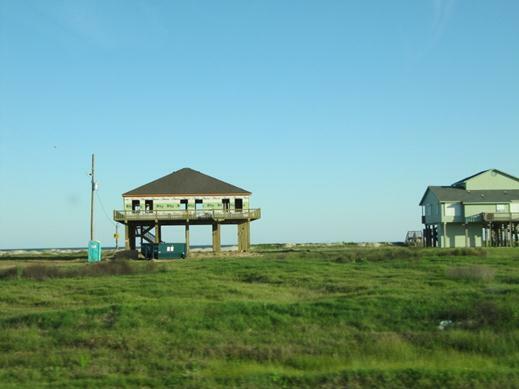 Almost all homes along the Texas Gulf Coast are on stilts – two stories up – in a faint attempt to protect against hurricanes. 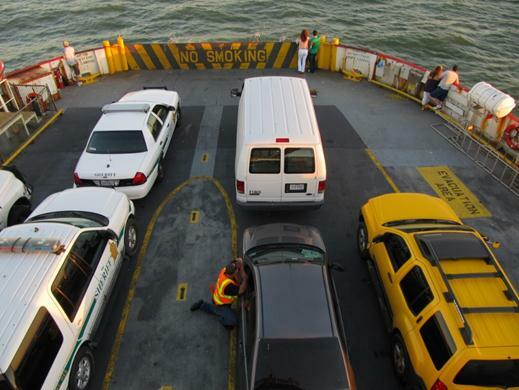 A free ferry ride takes us over to Galveston Island. Bottlenose dolphins swam alongside for a while too! 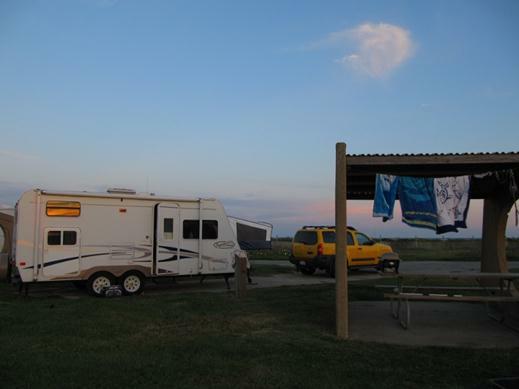 Our campsite at Galveston Island State Park…$16 per night right on the beach! Sunny, 32C and 95% humidity but there is a constant Gulf breeze and refreshing water makes for lazy summer like days. 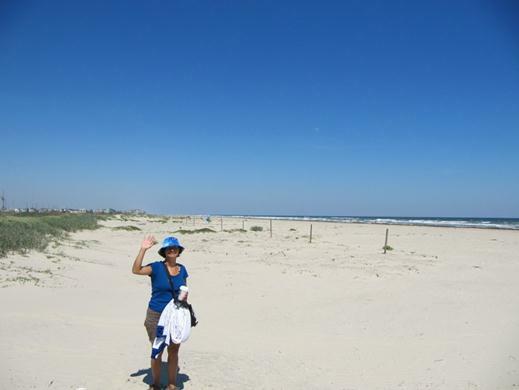 Galveston Island’s beach was nice – except for all the sea weed. Apparently spring is peak season for sea weed. 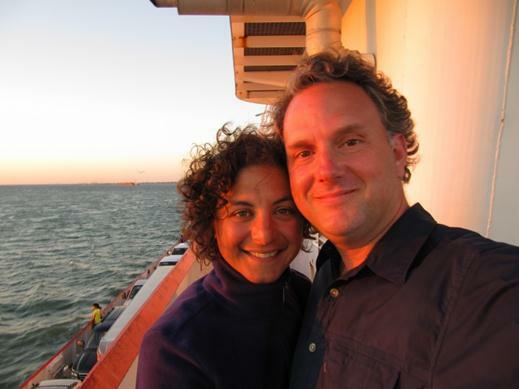 Galveston built a sea wall to protect against hurricane damage. 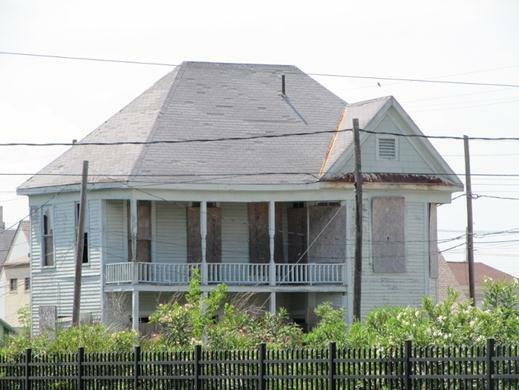 Hurricane Ike’s overall impact was minimized but still managed to do some serious damage. Ike’s storm surge submerged the entire island in 8 feet of water (http://www.greatdreams.com/weather/hurricanes-2008c.htm). 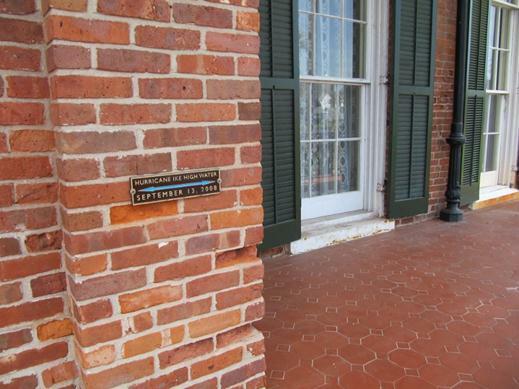 In this picture you can see the water level on this house located downtown Galveston. Some homes and businesses are not back yet. But many are. 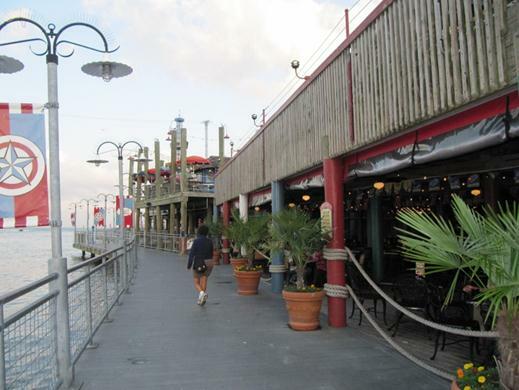 The Strand is the place to be in Galveston. At least that’s what they told us. There are some neat buildings to see. 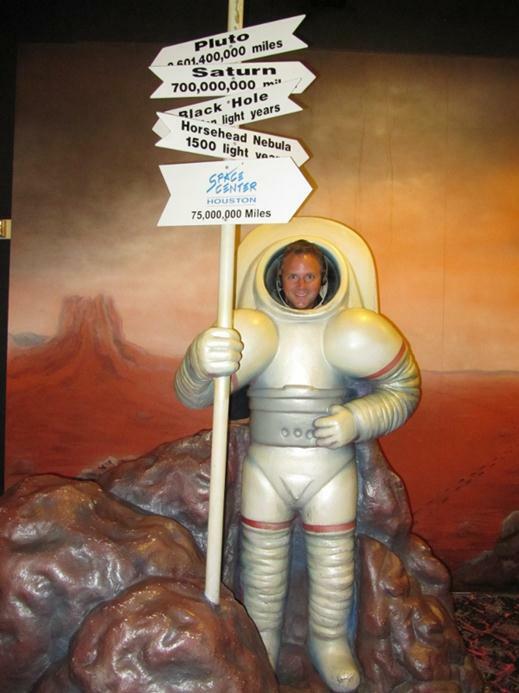 We also drove to some of the Houston attractions such as Johnson Space Ctr. 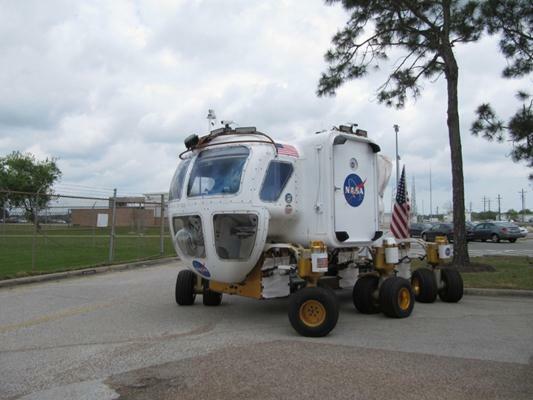 This new rover design uses Xbox 360 controllers! Kemah Boardwalk was cool. It reminded us of Disney’s boardwalk in Orlando, FL. Lots of restaurants, rides and attractions. 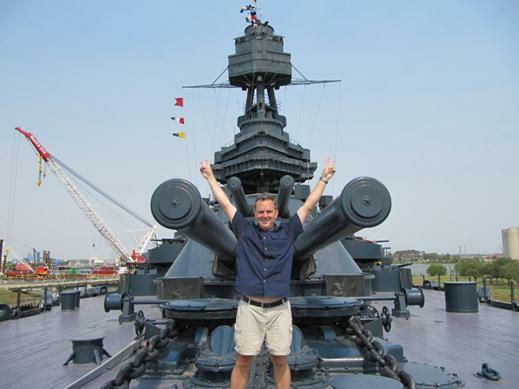 But, Battleship Texas in San Jacinto takes the cake. This amazing ship served in WW1 and WW2. It was also the flagship for the D-day invasions. 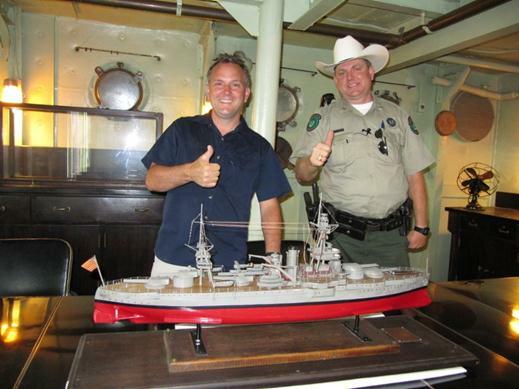 Our new friend Mark Braddock – a ranger with Texas Parks & Wildlife – takes us on a behind the scenes tour of Battleship Texas. 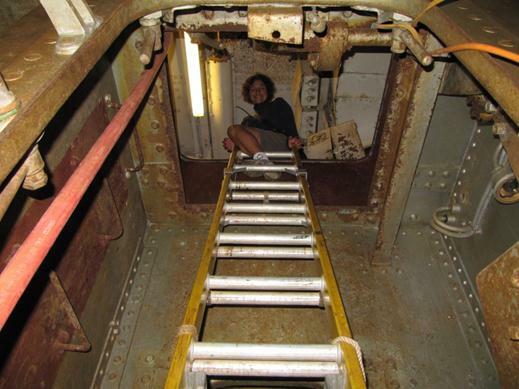 We scaled down into the bowels of the ship. We also really enjoyed the San Jacinto battlefield where Sam Houston won the battle for Texas. 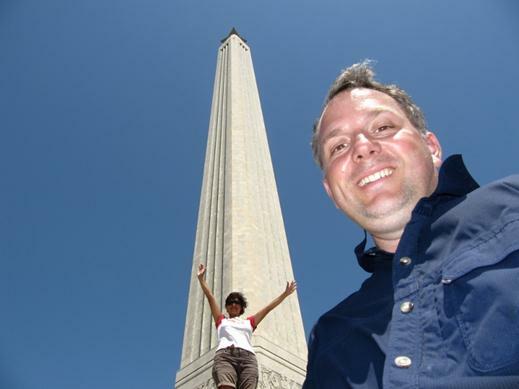 This 500+ foot tall monument to Texas independence is larger than the Washington Monument…everything is bigger in Texas! Next up – San Antonio, TX. Hi! 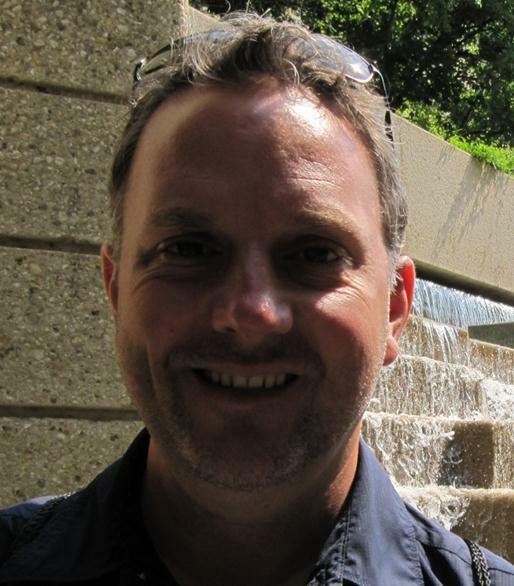 I met you two at McKinney Falls State Park ( the ranger from Buffalo) Your site and pictures are really great!! I look forward to keeping up with your adventures, I hope your travels are safe and loads of fun.